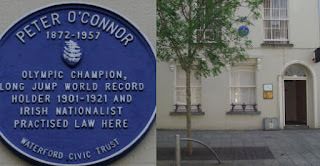 In the 1906 Olympic Games in Athens Peter O’Connor, a lawyer from Waterford, won a silver and a gold medal. Prior to independence Irish athletes took part in the games as part of the British team and during the medal ceremony O’Connor brandished a green flag to emphasise his Irish nationality. Footage of his jump can be seen on the top floor of the Bishop's Palace.